On this September 12, we had more rain showers in the Gorge, first drops making it past Mosier since June! Most likely we will be bidding farewell to those heat waves of summer, of which we had plenty, injecting triple digit heat and wildfire smoke over the Northwest. The feature we see often mentioned in the forecasts, is the Thermal Trough, really a thermally induced trough, a tongue of hot air extending most reliably from central to northern California, into southwestern Oregon. In its usual, more limited phase, it critically affects the winds of the South Coast, where Oregon windsurfers know, the strongest ocean winds most often live. This image depicts the pressure gradients, temperatures and wind barbs of a classic summer day for the Coast and Gorge. Note the heat of the Great Basin in grey, and the tight isobars indicating westerlies over the Central Gorge, and along the South Coast for northerlies, a ripper for both places…..
Here’s what happens when the thermal trough gets more expansive, in over the Cascades. Note the wind reversal over the Gorge…these hair dryer easterlies can easily fan wildfires as they did last year at Eagle Creek, while downslope winds off the west side of the trough, bring sunny hot days to Portland. Coast winds usually build up toward Astoria during this time, while maintaining the blistering pace at Pistol. Here the thermal trough is all the way over the Coast range, and even heating up the South Coast, moving greater pressures for northerlies, up toward Astoria and the North to Central Coast. Modest to moderate easterlies maintain for the West Gorge, yet another day. Holy Heat wave….here the Eastern Gorge is extra hot with light winds, easterlies are milder in the West Gorge, and north winds more confined to the northern Oregon Coast, and WA shorelines too. A southerly marine surge often accompanies this scenario with fog creeping up the Coast, starting here at the California border with mild southerlies. 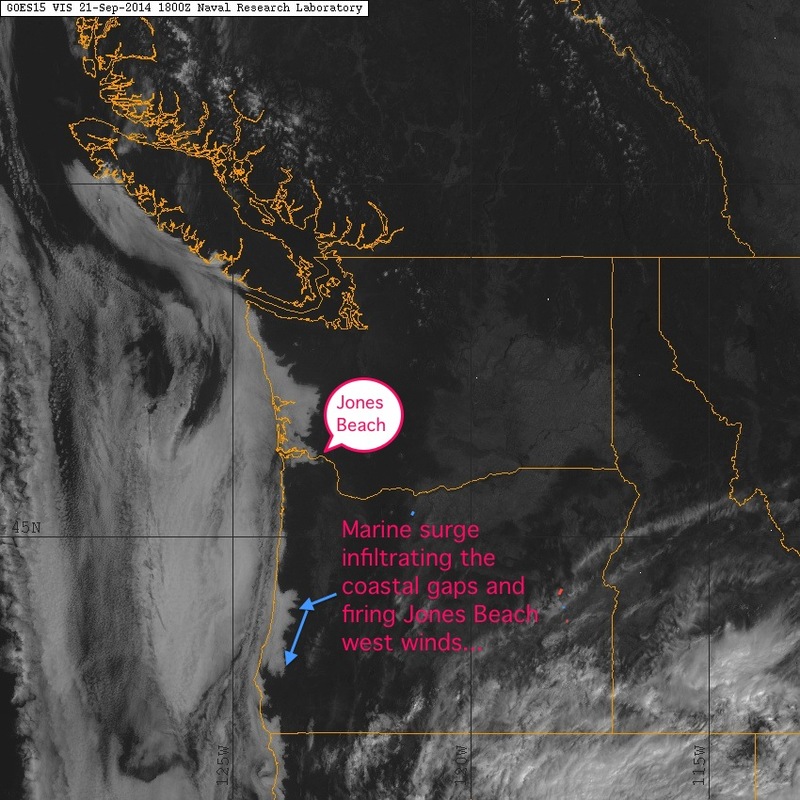 Now we see the set up for the marine surge to bring cooler air back to the Gorge, after the fog makes it all the way north. This makes for a solid WNW day at Jones Beach, and maybe mid to upper teens westerlies in the Corridor and Stevenson. The cooler air can be noticeable near Hood River, and often the next day is a good strong westerly from Swell City to Dougs, with the cloud bank filtering even further up the Columbia, sometimes past Stevenson.